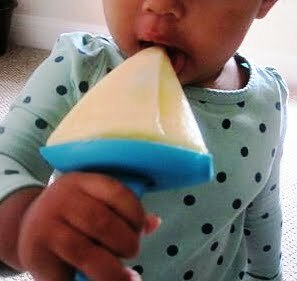 We made 4 pops, so I used 1c of each and about 1/2c pineapple. Freeze in molds until solid. If you're like my babygirl and you just can't wait until they're solid, they also taste good as a slushy! We have been using these BPA free molds from Cuisipro. I also have my eye on these from Onyx. Oh yum, I need to try that. vegan.in.brighton, I bet you already have what you need in the fridge! YUM, those sound easy and delicious! I've bookmarked to try in a few weeks here in Sydney. Thanks! Let me know how you like them Angela! I love these pops!!! My kids love Ice Pops or popsicles or frozen treats!-I made one that looks like candy corn for halloween!! I really love the pop holder though....gonna look into that one for sure!! Ooh, I'm going to have to check out your candy corn one. How festive!